We all start as beginners, if you want to learn how to knit then the first two things you need to learn is how to tie a slip knot and how to cast on. This tutorial will show you step by step on how to tie a slip knot, plus two very easy ways of casting on your stitch. What does tying a slip knot means? When you begin a new knitting project, you tie a slip knot which also acts as your first cast on stitch. This knot will form a loop which you will transfer to your knitting needle and yes, this first stitch is also counted as your first cast on stitch. There are so many ways to cast on, but for beginners these two methods are the easiest and most commonly used. So after you tie your first slip knot, you can either use the “Knit Backwards Loop Cast On or Single Cast On” method or the “Knit Cast On” method. What are the main differences between “Backwards Loop Cast On / Single Cast On” method with “Knit Cast On” method? Backwards loop cast on is very easy to learn and very fast to do for beginners, but after you knit for a while you will notice that it is hard to control the tension of your first row and the stitches may get uneven. While knit cast on method is slightly more difficult to learn when compared, it is easier to even out your first row stitch. I have gone ahead casting on and knitting a few rows to show you what they look like. 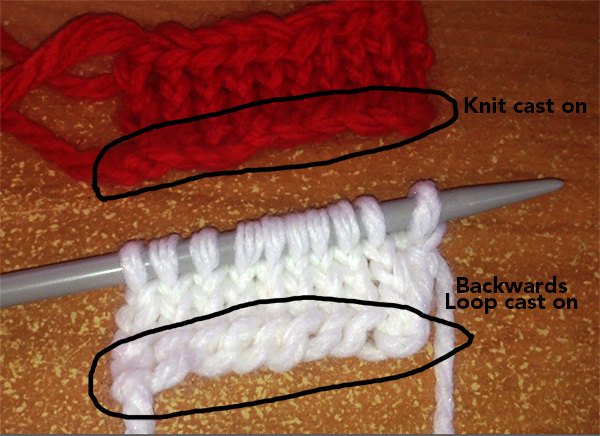 The swatch in Red is made using “Knit Cast On” and the swatch in white is made using the “Backwards Loop Cast On”. In this photo example, you can’t actually see any unevenness with the white swatch as the cast on is not that long. In general it’s harder to control the evenness when you have a big project. With the Knit Cast On, the cast on edge is more rigid than the backwards loop cast on.